The consensus was right. Although some votes are still rolling in, the Republicans have held onto their Senate majority (and they are tracking to add at least a couple seats to their majority), while the Democrats are poised to retake control of the House of Representatives with what looks like a 34-seat swing. You could call it the “something for everyone” election, as both sides are seemingly pleased with the results. We will only scratch the surface on the investment implications, but look for more from us on these topics in the coming days. So is gridlock good? Perhaps. S&P 500 Index futures are up solidly overnight. Moving past the uncertainty is positive. The market got what it expected, which—all else equal—is positive. Some investors like checks and balances that can take extremes out of play. The S&P 500 is now in the 12-month period post-midterms, and the S&P 500 has not been down in this period since 1946. 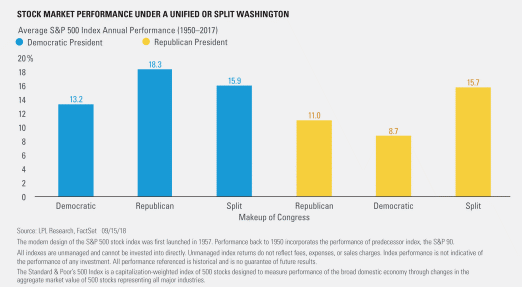 Based on history, Republican presidents and a split Congress have been one of the best combinations for stocks, which have gained 15.7% on average in this scenario based on the S&P 500, as shown in the LPL Chart of the Day. A small infrastructure bill is a possible area of compromise between the President and the House Democrats. The spending trajectory remains higher even under divided government, though perhaps less so now. Medicaid expansion may be in the cards under more Democratic leadership, while efforts to control drug prices are likely to continue. Deregulation efforts by Republicans may slow down, though executive orders remain in play. Financial services. The House Financial Services Committee will not be nearly as friendly to the financial services industry. The committee’s efforts may slow the pace of the President’s deregulation efforts. 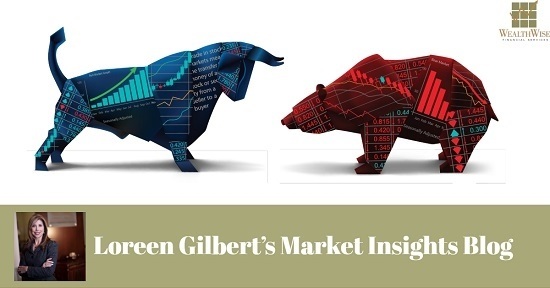 Look for more analysis on these issues in Monday’s Weekly Market Commentary.